HOFFMAN ESTATES, Ill. (June 4, 2015) – Since the U.S. went to war in Afghanistan in 2001 and Iraq in 2003, about 2.5 million members of the Army, Navy, Marines, Air Force, Coast Guard and related Reserve and National Guard units have been deployed in the Afghanistan and Iraq wars,* and the remaining 5,400 troops are expected to withdraw in 2016. ** While these brave individuals may be leaving the front line, a different kind of challenge awaits at home, such as transitioning to a civilian job or potentially adjusting to life with an injury. To support these veterans, the Craftsman brand is teaming up with Iraq and Afghanistan Veterans of America (IAVA), the leading and fastest-growing post-9/11 veteran empowerment organization in America, and We Are the Mighty (WATM), an entertainment and lifestyle media brand for and by the military community, to release a series of short films illustrating how IAVA empowers veterans as they transition back to civilian life. Continuing its long-standing support of America’s military heroes, Sears is launching two promotions to raise funds for IAVA this summer. 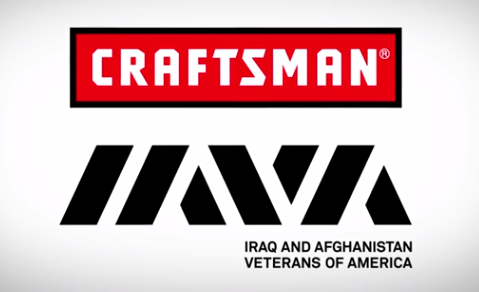 Thanks to member and customer support of the Craftsman brand, the brand will donate $250,000 to IAVA to empower America’s veterans. And from May 25 through July 4, for every new follower of @Craftsman on Instagram, Craftsman will donate an additional $1 to IAVA (with a minimum donation of $5,000 and maximum of $100,000). To check out the project, or for more information about how Craftsman is supporting veterans this Father’s Day, head to www.craftsman.com/iava, or visit www.craftsman.com/fathersday to find the perfect gift for the veteran or Dad in your life this Father’s Day. The Craftsman brand is America’s most trusted tool brand. For 87 years, the Craftsman brand has developed innovative tools and products, earning a reputation for unsurpassed quality and durability, trusted for generations. The Craftsman brand offers a full range of hand and power tools that meet the needs of the DIY user to the demanding professional. In addition, the Craftsman brand also offers lawn and garden products and tool storage. The Craftsman brand also has a free membership program called Craftsman Club which gives tool enthusiasts access to exclusive deals, members-only projects, expert tips and news on the latest tool innovations from the brand. Craftsman Club® is part of the Shop Your Way® network, so points can be redeemed for purchases at Sears and Kmart and online at Craftsman.com. For more information, visit www.CraftsmanClub.com. We Are The Mighty (WATM) is the first entertainment and lifestyle brand for and by the military community and those who want to know more about it. We create and distribute authentic content for all genres and platforms that entertains, informs and celebrates military life. Our mission is to empower this vital community with content and experiences that have a positive impact and engage audiences on the widest possible scale. We are committed to employing veterans and supporting their businesses and organizations. For more information, visit www.wearethemighty.com.